Your opinion counts and our team is really interested in hearing comments on the article of Woolly mammoth. The recent news about the possibility to recreate woolly mammoth through merging mammoth and elephant DNAs led to discussion in the research and conservation communities. Harvard University experts spliced recreated genes from a woolly mammoth into the DNA of an elephant and found they functioned normally. There has been a recent correspondence on Facebook with a comment that this practice is welcome in order to heal our world. What should our strategy be in order to restore self-willed land? What do you think of self-willed land as described from two different sources? The Telegraph quoted Professor Alex Greenwood, an expert on ancient DNA, who said: “We face the potential extinction of African and Asian elephants. Why bring back another elephantid from extinction when we cannot even keep the ones that are not extinct around? What is the message? We can be as irresponsible with the environment as we want. Then we’ll just clone things back? Share your opinion with us! Are we playing God? or Should we accept de-extinction through DNA engineering in order to restore wilderness? Where will this lead? I think that you will never be able to “return” European ecosystems to what they were in the past. Because…how would you define “the past”? What would be your measure? 1876? 1453? 1220? 437? Or something 5000 years ago? The climate has changed so often since then that you will never make that work. What needs to happen with European wildlands is returning them to a functioning and self sustaining ecosystem. To achieve this you would either have to have human intervention to activily re-wild these places or you lock them up and leave them be for 500-1000 years. 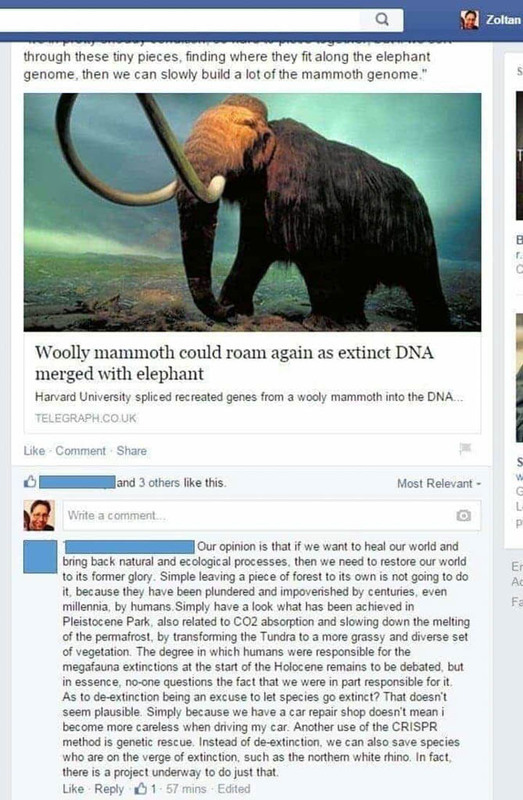 Bringing back the mammoth just makes no sense. We dont have ecosystems or environments that could support them.